In the past year, Kenes Group team members have been recognised by different industry bodies as changemakers, top industry professionals, young leaders, or simply – the engine behind our client wins.
" We want to extend that recognition to everyone on our team – because, without every person’s diligent work, we wouldn’t be where we are today.	" Geneva, Switzerland, December 12, 2017 – Looking back at 2017, we are proud to move into the new year with our golden team. In the past year, Kenes Group team members have been recognised by different industry bodies as changemakers, top industry professionals, young leaders, or simply – the engine behind our client wins. 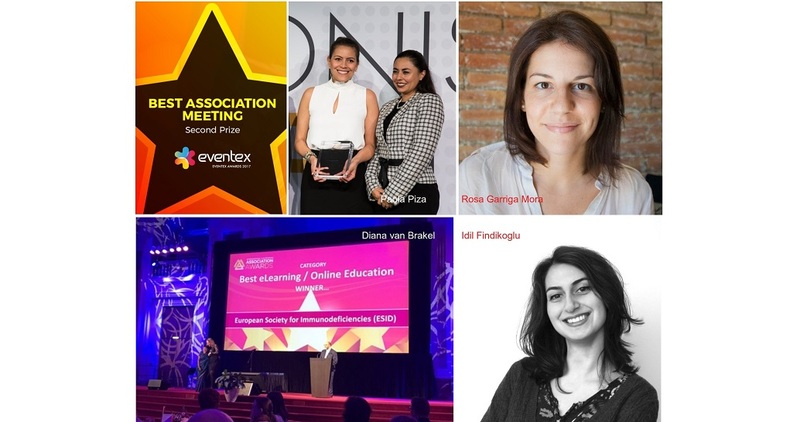 We are proud to have Diana van Brakel, Rosa Garriga Mora, Paola Piza, and Idil Findikoglu on our team, changing the industry one step at a time. One of our biggest celebrations this year was the European Society for Immunodeficiencies (ESID) winning the Best eLearning/Online Education category for the ESID Education Online Portal, at the International & European Association Awards. Kenes Education’s team is specialising in international medical education. For this project, the Education team used their expertise in CME/CPD Accreditation and combined it with their extensive know-how in designing effective and independent medical learning activities. Coupled with the close understanding of the needs of the association provided by Kenes’ Association Management team, and through collaboration with the ESID board, the ESID Education Online Portal now gives learners the opportunity to tailor their learning to their specific needs and obtain CME credits. Diana van Brakel led this project and accepted the award on behalf of ESID – a moment of pride for all of us. The 7th Global Eventex Awards further recognised our work on the Paediatric Infectious Diseases Meeting (ESPID) 2016 meeting, for which Kenes Group was awarded the second place in the category Best Association Meeting. Connect Corporate runs an annual 40 under 40, and in 2017 the recognition went to the top Meeting Architects, among which was our Meeting Architect, Rosa Garriga Mora. MeetingsNet’s annual Changemakers report recognised 20 individuals who are successfully moving their organisations and our industry forward in unique and positive ways. Once again, Rosa Garriga Mora was listed among the most talented and inspiring event professionals in our industry. Paola Piza, Regional Business Development Manager, LATAM, was recognised as one of the top 15 event professionals in Latin America at the World Meetings Forum 2017. This is the fifth year of the top 15 list awarded by LM Latinamerica Meetings magazine. A very proud moment for our Latin America division. PCMA announced the 2018 Class of 20 in Their Twenties, where Idil Findikoglu, Marketing Manager, was recognised as one of the future leaders in the industry. It is an impressive class of young talent. Kenes Group boasts two more alumni on our team – Rosa Garriga Mora, Meeting Architect (inaugural class of 2014) and Magdalina Atanassova, Marketing Communications Manager (class of 2015). We feel incredibly proud of our team that strives to challenge the industry daily, to work towards advancement and improvements, for both us as event organisers, and for our clients. We know that the industry is in good hands, and we are humbled by the professionalism and drive that our team possesses. Congratulations to Diana, Rosa, Paola and Idil, for the industry recognition. We want to extend that recognition to everyone on our team – because, without every person’s diligent work, we wouldn’t be where we are today.